Even though you know the kiln is not that hot: this indicates a thermocouple failure. Check thermocouple end. Examine end carefully. Sometimes there can be a crack that opens up while the kiln is hot but appears to be normal when the kiln is cold. If the end of the thermocouple looks severely corroded and you are getting Error codes then it is best to replace the thermocouple. Check thermocouple circuit. For instance check to make sure that all the thermocouple lead wires are firmly connected. Check where the thermocouple lead wires go into the ends of the thermocouples. Are the wires loose? Tighten the screws on the ends of the thermocouples to be sure you have a tight connection. Check for corrosion. Check where the thermocouples connect to the DynaTrol. Try pulling off each connection and reseating it. This can scrape away corrosion that may have built up. Check for melted wires. A very easy check is to check resistance (ohms). Remove the thermocouple lead wires from the thermocouple head and check resistance with your meter. If the thermocouples and circuit is normal then you will see a resistance of about .9 or 1.0. If you see an OL in your meter then you have an open circuit somewhere which is probably a bad thermocouple. Carefully examine thermocouple tip. 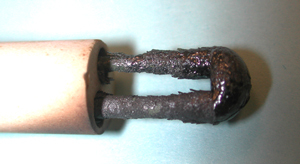 This is the exposed welded joint at the end of the thermocouple that is not covered up by the ceramic tube. To do this you will have to remove the thermocouple from its protection tube (if it is a kiln that has one of our protection tubes). You can do this with the kiln disconnected from power. Look for corrosion - especially if it severe. These thermocouple tips will oxidize and otherwise corrode over time. That is normal. There is some point, however, at which the corrosion affects the ability of the tip to work (thermocouples work by generating a small voltage at the tip caused by two different metals reacting to each other). Make sure the two wires are securely joined. One of the things that can cause an intermittent problem is a bad weld. If the two wires touch each other (even if they are not welded) they may work temporarily. However, if the weld is not secure then the wires could separate when the kiln heats up and cause an intermittent failure. If the thermocouple tip looks healthy then test the control board.